This week's team selection for the World Indoor Championships highlights the strength the British squad has across the board. After last week's Grand Prix in Birmingham, where all-time indoors lists were rewritten and multiple national records fell, British athletes have set themselves up well for next month's championships in Turkey. Unlike the Glasgow International Match and the UK Trials, Birmingham gave British athletes the chance to compete against world class opposition and get a lift. And most of them did just that. We certainly have a gold medal contender in Jessica Ennis, reigning World Indoor pentathlon champion, who set the world's fastest time in the 60m hurdles. We may also have one in long jumper Shara Proctor. She broke the British record, which had stood for 28 years, to jump 6.80m. 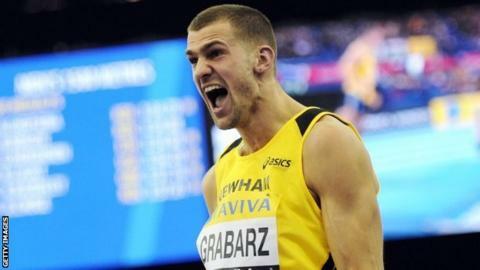 Robbie Grabarz (pictured) is also a podium contender if he continues his momentum - he won the high jump with 2.32m and was very close to a world-leading 2.39m. Our 400m boys, Richard Buck and Nigel Levine, definitely have a good chance. I'm not sure if world outdoor champion Kirani James, who would obviously put up a strong challenge, is going to Turkey but either way Richard and Nigel are both in the world's indoor top 10 after last weekend's showing. Meanwhile JJ Jegede leapt to a personal best of 8.04m in the long jump to beat a decent field, but his place in the team is dependent on him reaching the tough mark of 8.15m by 27 February. Then there was girl-of-the-moment Holly Bleasdale, who produced another solid 4.70m performance in the pole vault. Joe Thomas and Andrew Osagie will represent GB in the 800m as athletes in the world's top 10. For Andrew, Birmingham was his first race of 2012 as he's been having a few problems this winter, and he still ran a personal best. In the sprints, Jeanette Kwakye wasn't as good as she's been in previous weeks but Asha Philip ran well to finish fourth as the only Brit in the 60m final. Jeanette won't be on the plane to Istanbul, youngsters Philip and Jodie Williams will pull on the GB vest instead. The men's hurdles was a little disappointing from a British perspective and suddenly the gap between us and the world's best has been revealed. Hannah England suffered a heavy defeat by Ethiopian runner Genzebe Dibaba, who beat her by eight seconds in the 1500m. Dibaba is in great form and Hannah decided not to go with the suicidal pace Dibaba set early on. The trouble with that was that Hannah's too good for the runners behind her and so she got caught in no-man's land. Maybe she could have gone with Dibaba to see how long she'd have hung on and find out more about what shape she's in? All in all, it was a wake-up call for one or two athletes as to what the true world level is, but others will realise they can go to the World Indoors with a real chance of success. Steve Cram was talking to BBC Sport's Jessica Creighton.